GeForce Experience offers gamers easy access to driver updates, recommended game settings, gameplay recording and streaming, screenshot and in-game photo captures, and much more. We are excited to share that we are officially releasing Ansel RTX and Freestyle in version 3.18, which is available now as an in-app update. NVIDIA Freestyle gives you the power to customize the appearance of a game in real-time through the application of post-processing filters. Add sharpening, adjust color and contrast, or make your own filter by stacking and tweaking any of the 17 available filters. To apply Freestyle filters in any of the 200+ games currently supported, simply press Alt+F3 during gameplay. 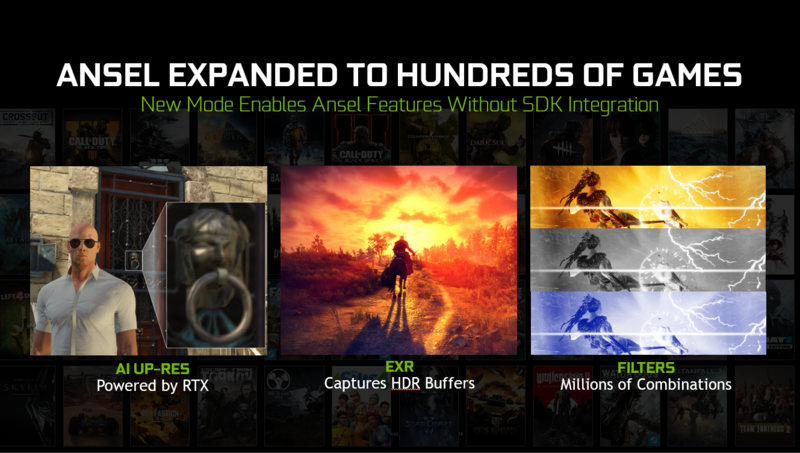 Ansel RTX expands select Ansel Photo Mode features to hundreds of games, allowing you to add stackable filters, save in HDR format, and capture photos at up to 8K resolution using AI Up-Res on GeForce RTX graphics cards. With Ansel Up-Res, we use Tensor Cores on GeForce RTX GPUs to render supersampled 8K screenshots super quick, giving you more detailed, less aliased in-game photos to upload to ShotWithGeForce, or use as a desktop wallpaper. To use AI Up-Res, press Alt+F2 to open the NVIDIA Ansel interface, select the “Super Resolution photo” Capture mode, and under “Method” choose “AI Up-Res”. Then, adjust any other available options and click “Snap” to save your picture to the Alt+Z GeForce Experience Gallery. Developers around the world continue to add NVIDIA Ansel and NVIDIA Highlights to their games, giving players the tools to capture stunning in-game photos, and their best gameplay moments. This includes big hitters like Hitman 2, BattlefieldTM V, Dragon Quest XI, Metro Exodus and Shadow of the Tomb Raider, and indie favorites such as Deep Rock Galactic, Insurgency Sandstorm, and My Time At Portia. In total, 22 games have added support for Ansel, Highlights, or both, over the past 6 months.